We know we’re not the only ones who, when the bread basket arrives on the table, dive in and start scarfing down as many rolls as we can get our hands on before our actual meals arrive. 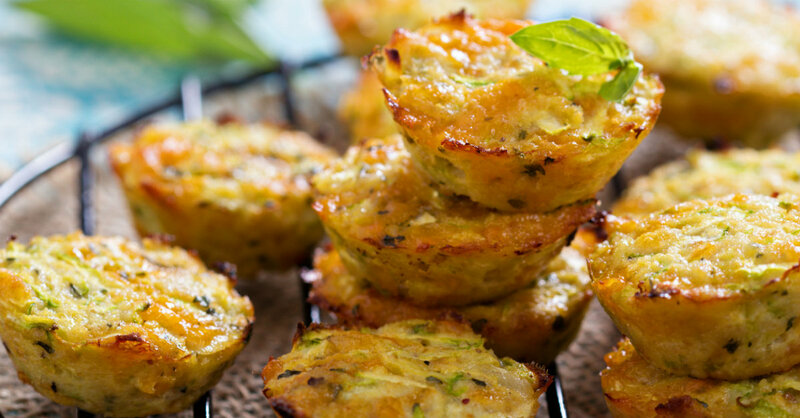 We don’t know what it is, but this happens more often than we care to admit and we wanted to come up with something we could shovel into our mouths without feeling guilty…luckily, this recipe fits the bill perfectly and these cheddar biscuits – which are packed with cauliflower and broccoli! – weigh in at under 30 calories each! It doesn’t get better than that! Preheat oven to 400º F lightly grease 1-2 (mini) muffin tin(s) with butter or non-stick spray. Working in batches, place cauliflower and broccoli florets in food processor and pulse until is resembles grains of rice. Place grated vegetables in a large, microwaveable dish, along with 3 tablespoons water, cover with a damp paper towel and microwave for 5 minutes, or until cauliflower is tender. Carefully remove steamed cauliflower and transfer to a clean kitchen towel. Wrap up the cauliflower and wring out all excess moisture into the sink. Repeat until all liquid has been drained. Transfer cauliflower and broccoli to a large bowl and mix in cheddar cheese, Greek yogurt and eggs, then season with salt, onion and garlic powder, and pepper. In a separate bowl, beat egg whites until stiff peaks form, then gradually fold egg whites into cauliflower mixture. Don’t over mix. Spoon batter into muffin tins, then place muffin tins in oven and bake for 25-30 minutes, or until tops are golden brown.